Kayaks and kids go together like fun in the sun! All youth, 9 years of age and older are invited to join us for our weekly Youth Kayak Program. This program excels at implementing our core values of safety, fun and learning! 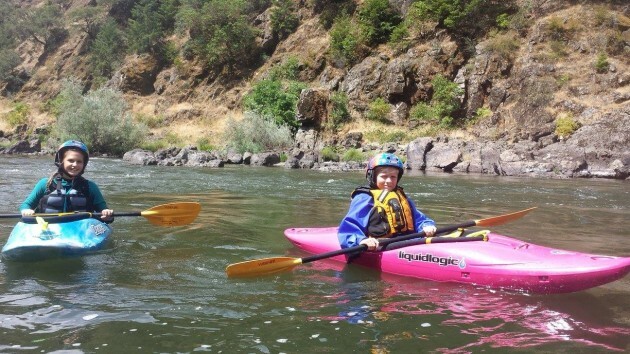 We are excited to share the Rogue River with youth because it offers the perfect playing and training course for beginning kayakers. It’s warm waters are usually around 60 degrees and make a day on the river very pleasant. In addition, the Rogue offers several calm sections of still water for skill development often disguised as fun, team building games. And lastly, it is common to see wildlife and waterfowl along the Rogue. Kayaking is a healthy and exhilarating activity! It offers connection with nature’s wonders while building self-confidence and better awareness of self, others and current surroundings. On the individual level, kayaking promotes the development of both physical and emotional strength. In addition, every individual kayaker must be a team player for success. The support and enjoyment that is shared with the people you kayak with is remarkable. Your course begins with properly outfitting boats and making sure all gear fits well and students are comfortable with their equipment. The first, on-water, skill we will learn is called the wet exit. This skill allows the student to efficiently get out of the kayak when turned upside down while we mentor the calm attitude that goes along with this experience. We will know how to be safe on the water, while learning skills for decision making, leadership, and maximizing fun! The sheer joy of sitting on the water, paddling and navigating down a river, makes kayaking an unforgettable life experience. It is one of the best ways to connect with the natural environment, get outside, stay fit, and challenge yourself mentally and physically. The life lessons learned on the river help to build character and inspire courage that youth can carry with them into adulthood. Our instructors are ACA Certified and Wilderness First Responders. We all share a true passion for kayaking and the outdoors, with an unmatched ability to inspire others. We offer a progression based class which starts on flat water and moves at the student’s pace, gradually working up to moving water. Our instructors ensure that every student feels included and receives adequate attention, coaching and encouragement. The consistency of weekly instruction allows for the excitement of clear and big improvements, combined with the opportunity to form lasting friendships and paddling partners. If you are interested in learning more or registering for our weekly Youth Kayak Program please contact Sundance Kayak School. Thank you!